‘Cartel 2045’ Movie Review – Spotlight Report "The Best Entertainment Website in Oz"
There’s a certain pleasure in watching cheaply-made action and sci-fi films. On top of whatever it is you’re actually watching, you’re also trying to figure out how certain shots were achieved (and laughing when they fail) and wondering whether the director got his cousin to staple the plywood sets together. You can usually tell which car is going to explode based on how clapped out it is. Some of this joy has been lost as digital effects and editing have gotten good enough to be passable in even the zeddest of the Z-grade flicks. Cartel 2045 is a cheaply-made film. We are talking obvious, unpainted plywood, paint-drape and pallet sets here. We’re talking spray-painted cars clearly bought out of the local classified section. In the age of plasma TVs thrown out with the garbage, we’re talking furniture shop prop TVs. 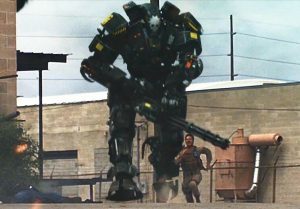 All the money seems to have been spent on 1: digital robot effects and 2: Danny Trejo, who plays the leader of a Mexican cartel that uses the robots in a reign of terror. So our heroes have to stop him and his robots. It’s also badly made. This film is clearly the product of a person who likes movies, but doesn’t understand movies. The editing doesn’t flow. There are far, far too many needless “cool” tracking shots that only make you think whatever conversation you’re watching is about to be pounced on by a monster. The music choices would better suit a horror movie – there’s even Ligeti’s Lux Aeterna straight out of 2001: A Space Odyssey in a completely inappropriate scene. It also has “grindhouse” dirt, grain and wear digitally applied, but still looks like it was shot on consumer-grade equipment. The cast seem embarrassed, and the (poor) dialogue is delivered with barely any eye contact or emphasis. The audio seems to be recorded on location without so much as a boom mic, or ADR-ed in with no genuine attempt at synchronisation. Numerous shots feature the back of a speaker’s head because they didn’t plan for shot/countershot. I cannot imagine a storyboard being used at any point; every scene appears to have been shot off the cuff. 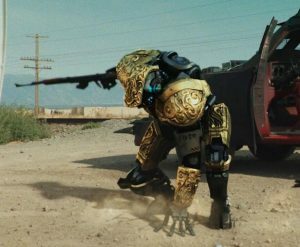 But this is all technical stuff, and I’m sure you’re wondering if a movie that features gangster robots in Mexico is at least fun in some way. No, sorry. This is not fun. Not even so-bad-it’s good. It’s a genuine drag to sit through. I really struggled to get all the way to the end. If I had to give the director some constructive criticism, it would be stop trying to be badass. You cannot be badass at this skill or budget level. You have to overcrank your style to make the audience laugh. 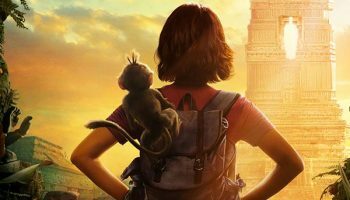 If this film had shown a trace of campy self-awareness, we could have had a Tremors or an Army of Darkness. Instead we got something that looks like it was made for YouTube by high school students.